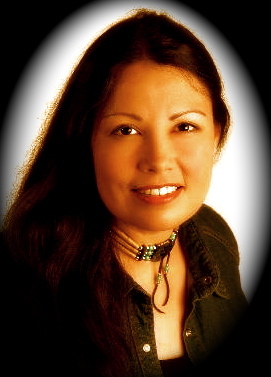 Welcome to the official website of the premier, Lakota Doll Artist, Rhonda Holy Bear. Rhonda's Grandma, Angeline, had been orphaned as a young child and had been raised by her Grandmother. Angeline's Grandmother, like many of the women of her time, was skilled in the traditional arts of quilling and beading. Around 1923, when Angeline was 5 years old, her grandmother brought her to a tribal gathering in South Dakota. Some affluent tourists visited their tipi. They had a little girl who was similar in age to young Angeline. While the adults talked in the tipi, the two little girls played with a traditional Lakota doll that Angeline's grandmother had made for her. Angeline loved that doll as if it were her little friend. It was made of buckskin and was adorned with beadwork. Grandmother had even stitched clippings of Angeline's hair to the doll's head. When it came time to say goodbye, the young tourist girl refused to leave without Angeline's treasured doll. She put up such a fuss that the tourists offered her grandmother a small sum of money for it. The little tourist girl happily left with the doll. Young Angeline lost her little Lakota doll friend. Listening to Grandmother Angeline's account, Rhonda could tell that, even after all those many years, Angeline still missed the doll. Angeline encouraged Rhonda to sew. All they had was black thread and a couple of needles. She told Rhonda that, if she collected as many fabric pieces as she could, she could make a quilt. Rhonda collected fabric like her grandmother had instructed but, she was not interested in making a quilt. What Rhonda wanted were toys, especially dolls. Eventually, Rhonda had salvaged as many materials from around the house as she could. Still driven, she took a walk to the dumping ground in search of other things she might use. The dump proved to be a good source for supplies and materials. On the way home from the dump, she would collect clay from the river bed. She brought the clay home and fashioned a crude sculpture of a head. As soon as the clay head had dried, eleven-year-old Rhonda Holy Bear confidently marched to the Mobridge Museum. She asked the curator to put her clay head on display. The curator took it in exchange for the last exhibit Rhonda had previously donated--her rock collection! Little did Rhonda know, at the time, what an important role museums would continue to play in her life. When Rhonda was fourteen, she moved to Chicago to live with an aunt. She had long been intrigued by the tales she had heard about this great city. Rhonda wanted to sing. She wanted to be on television and on the radio. She wanted to explore all her talents. She jumped at the chance to go. She enrolled in a school that had strong arts and cultural history programs. Many acclaimed Native artists and tribal members visited the students and gave demonstrations and lectures. Rhonda thrived in this environment. She excelled in drawing, painting, singing, acting, and dancing. She got to fulfill her dreams of playing guitar and singing on both the radio and television. She acted and danced in school plays. She even won an Indian Princess Pageant when she was 16. Her teachers called her "The Multi-talented Kid." Rhonda loved all the arts in which she was excelling. She would eventually focus most of her energies on singing and art. She found herself particularly drawn to the more traditional, hands-on skills of beading and sculpting. These skills reminded her the most of her Grandmother, Angeline. In 1978, when Rhonda was eighteen, she picked up a book and discovered a picture of an antique Indian doll from the late 1800's. She remembered the story her Grandmother had told her, years before, about her long-lost doll friend. She was inspired to create a doll at that very moment. As usual, money was scarce. Rhonda only had ten dollars. So she did what she always had done; she used whatever she could find around her to create. She made the doll body from her pillowcase. She found a coat hanger from which she fashioned an armature. Using the only money she had, she bought a bag of cotton balls from the drug store and a car chamois from the hardware store. Rhonda used the chamois to simulate the look of traditional brain-tanned buckskin clothing. She stuffed pieces of her pillowcase with the cotton balls. The doll needed hair. Rhonda cut some of her own hair and sewed it onto the doll's head--just like her own Great Great Grandmother had done for Angeline's doll, decades before. 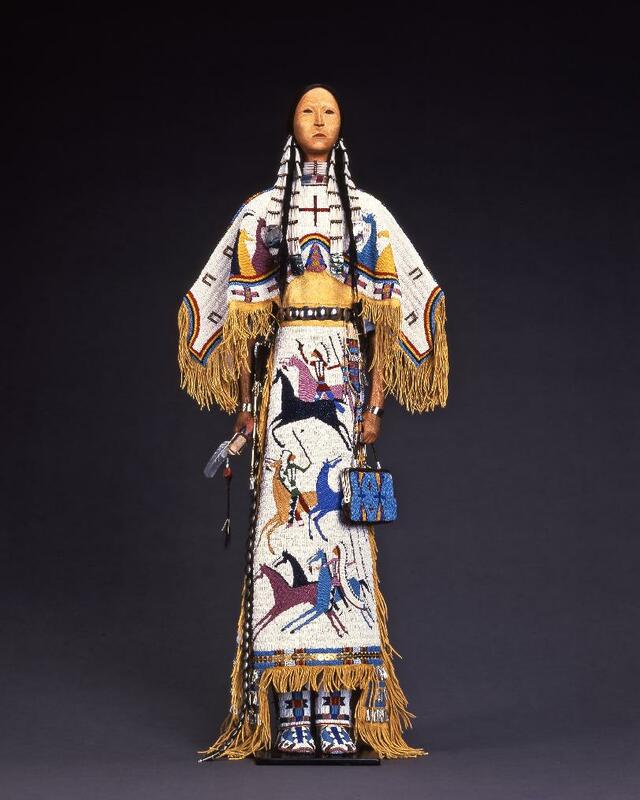 Rhonda put the final details on the doll: a dress with a fully beaded yoke, moccasins, leggings, and a leather belt with conchos, fashioned from thumbtacks. Rhonda was following in her Great Great Grandmother's footsteps. Rhonda was delighted with the doll and was inspired to create a few more. She held onto them until 1982, when she saw an ad in The Chicago Sun Times for a new art gallery called American West. Curious, she decided to check it out. The gallery owners took notice of Rhonda and offered her a sales job, which she accepted. The gallery owner offered her a ride to work the next day. When he arrived at Rhonda's apartment the next morning, the gallery owner noticed the dolls Rhonda had made. He asked who had made them. When Rhonda told him that she had made them, he was intrigued. He asked Rhonda to bring the dolls to the gallery to show his wife, who was a doll collector. Rhonda agreed. Later that day, the gallery owners offered Rhonda eighty dollars for two dolls. Rhonda accepted and the two dolls sold immediately the following day. Stressing the sales potential, the gallery owners requested that Rhonda bring in more dolls for display. Rhonda responded by bringing in eight more. That very day, a woman came into the gallery and bought all of them. The gallery owners, again, requested more dolls. 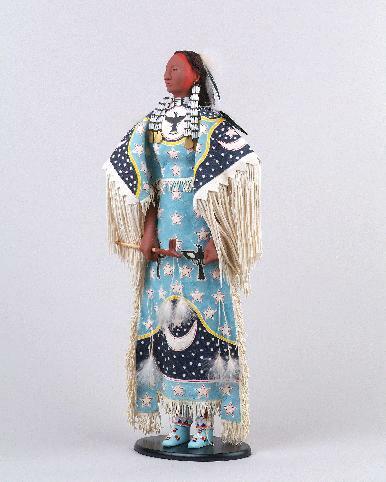 By running an ad in American Indian Art Magazine, they helped introduce Rhonda's dolls to the world. Rhonda could feel the momentum building. Now, out of school, Rhonda was a young, self-motivated artist. She longed to study the artifacts and art of her people. She had been accepted to the Art Institute of Chicago on the merits of her portfolio, which included slides of drawings, paintings and dolls that Rhonda had made. Unfortunately, she lacked the necessary funds for the tuition and was unable to attend. This did not deter Rhonda from tirelessly researching and creating. She made weekly trips to the Chicago Field Museum on "Free Admission Night" which was on Thursdays. Rhonda was no stranger to this Museum. She had taken many field trips there with her classmates, back in high school. She had danced there as a Pow-Wow dancer. At the Field Museum, Rhonda had learned the traditional art of ribbon work from an older tribal woman named Sarah Keahna. She learned many Cherokee legends and arts from John White, a museum worker. Rhonda and her fellow students even got to take part in building a Long House. This museum had been very important to Rhonda. Now, a few years later, Rhonda would return to the Field Museum with her colored pencils and pad. Rhonda was fascinated by the workmanship of the traditional Native clothing. She recorded as much as she could about the art and culture of her people. Eventually, seeing the objects behind the glass wasn't enough. Rhonda longed to hold them in her hands and to study them up close. She imagined that, if she could only get behind the scenes, she could explore the treasures that were not on display. She called upon the renowned (but ever humble) historian, researcher, and scholar, Fr. Peter J. Powell. He spoke to the museum's curator. The curator then allowed Rhonda access to the vaults and to the literary and photographic libraries. For the next couple of years, Rhonda would spend countless hours researching there. Later, she would travel around the country, museum hopping. She would scour the bead stores, trading posts, and antique shops, in search of information, supplies and artifacts. "Rhonda Holy Bear's 'Crow Woman on Horse' and 'Lakota Family' depict clothing styles and accoutrements of the Plains in the 19th century. Her careful research and meticulous attention to detail set her apart as one of the most accomplished doll makers of today." 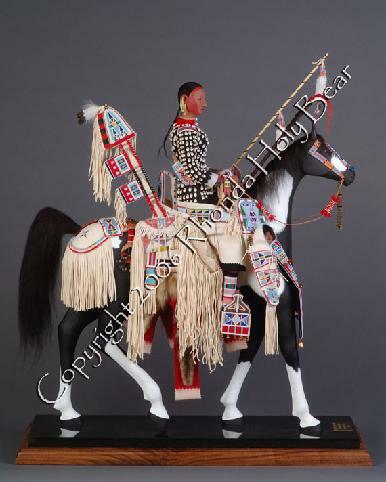 "Holy Bear draws her designs from the traditions of the Plains Indians. Stressing accuracy of representation, her dolls feature exquisite miniature bead and quill work as well as singularly expressive faces." "I do not believe work of this caliber and importance is being executed by any other doll maker in the United States." She went on to say, �Her enthusiasm for her craft contributes much to her ability to transform history into the magic of her dolls." Rhonda won the South West Association on Indian Affairs Fellowship Grant in 1985. A SWAIA article from that year states ,"Rhonda Holy Bear was a 1985 winner and the first doll maker to receive a SWAIA fellowship." Rhonda won a cash award and was given a booth at the SWAIA Indian Market in Santa Fe. At Indian Market, that summer, Rhonda won both First and Second Place awards in the Plains Style Dolls category. On that day, Rhonda sold all eight of her pieces in one hour. 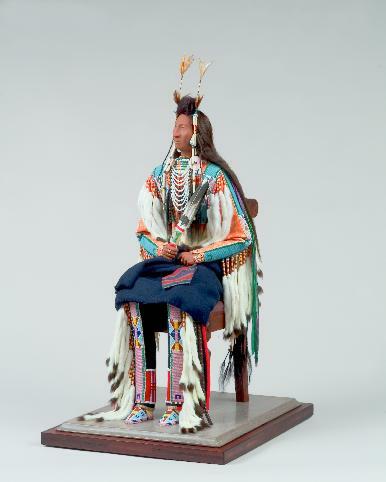 American West Gallery (Chicago, IL), El Parian de Santa Fe (Santa Fe, NM), The Wheelwright Museum of the American Indian (Santa Fe, NM), Mosi Lakai-Bi'Kisis, Inc. (Santa Fe, NM), The Morning Star Gallery (Santa Fe, NM: 1995-2000), Sherwoods Spirit of America Gallery (Santa Fe, NM: 2003), The Mitchell Museum/Kendall College (Evanston, IL. ), The Denver Art Museum (Denver, CO) and Rhonda's favorites: Fr. Peter J. Powell, D.D. and The Foundation for the Preservation of American Indian Art (Chicago, IL.) and The Paul Dyck Foundation Research Institution of American Indian Culture (Rimrock, AZ). American Indian Art Magazine (Cover); Architectural Digest; Doll Reader Magazine; International Doll World; Ford Times Magazine; Indian Artist Magazine; Native Peoples Magazine; Daybreak Magazine; Museum of the American Indian News; The Santa Fe New Mexican; Morning Star Gallery (Catalogue); Las Campanas Haven (Cover); Sondags Journalen (Denmark); The National Museum of the American Indian, Smithsonian Institute (publication); The National Museum of Natural History, Smithsonian Institute (publication); Mobridge Paper (SD); American West Gallery (artist publication); SWAIA Foundation Fellowship (Announcement 1985); Spotlight, The Sunday Star Ledger:" Icons of Innocence From Another America" (Montclair, New Jersey); El Parian De Santa Fe (gallery catalogue); "Connecting Generations - Contemporary American Indian Dolls," Sept. 14, 2003 - Feb. 15, 2004 (Montclair Museum Show Catalogue); "Prarie Art Culture - Working Within the Circle: Native American Representations of Self" by Stephanie Snow (Grinnell College internet article). Rhonda and her work have been featured in books, including: ARTISTS AND CRAFTSPEOPLE by Arlene Hirschfelder and NORTH AMERICAN INDIAN JEWELRY AND ADORNMENT-FROM PREHISTORY TO THE PRESENT by Lois Sherr Dubin. Both books feature one of the most pivotal pieces of Rhonda's career, "The Last Lakota Horse Raid." This piece is important for many reasons. Completed in 1991, it is a culmination of many years of research and soul-searching. It is a thirty-inch female figure, completely carved out of basswood. She is dressed in a fully micro-beaded dress. 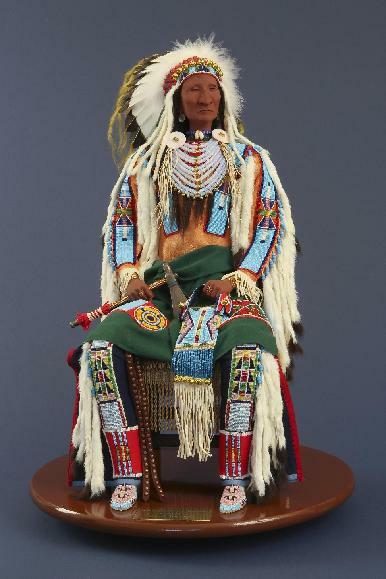 It is decorated with figures, beaded in the tradition of the Cheyenne River pictorial style. The fully carved body represents Rhonda's cultural "roots." The youthful appearance of the doll represents Wakan Tanka, who is eternally youthful. The scene, depicted and commemorated on the dress, represents White Bull's account of the Last Lakota Horse Raid of 1879. White Bull was the great Lakota warrior whose account of Little Big Horn is documented in Stanley Vestal's book, WAR PATH. The piece represents both struggle and renewal. 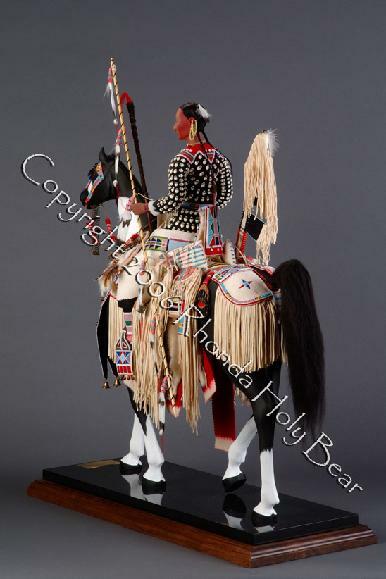 The Horse Raid depicted on the doll's dress represents the end of an era in Lakota History. 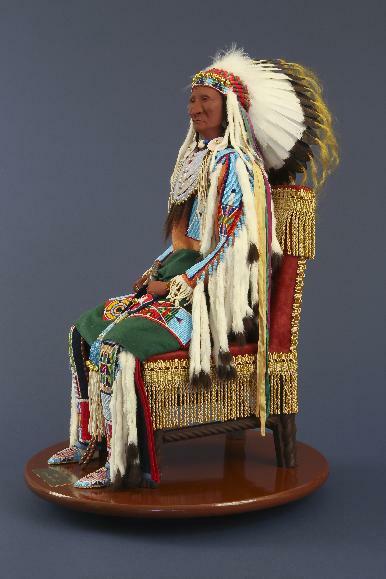 On the other hand, the figure is ultimately a symbol of the White Buffalo Calf Woman, who brought the Lakota People the sacred pipe and a message of peace and harmony. She is "Pte San Win," ("Light") the daughter of the Sun and the Moon. Rhonda's depiction of The White Buffalo Calf Woman carries a message of renewal and hope. The figure, with it's tall, elongated line, symbolizes a "spiritual reach." With "The Last Lakota Horse Raid," a piece rooted in tradition, Rhonda Holy Bear makes a relevant contemporary statement about the current struggles and achievements of her Lakota people. The piece is a symbol of Rhonda's prayer for the renewal and survival of the people. "The Last Lakota Horse Raid" is one of Rhonda's most powerful and influential works. With every doll Rhonda creates, she asks herself deeper and deeper questions about the subject of her self-expression. For Rhonda, the dolls have evolved far beyond being children's playthings. They represent her family and the roots of her tribal history. They have helped her to complete a circle in her journey as a Lakota. She still hears her Grandmother's voice as she creates her dolls. Rhonda recalls a vivid dream she had when her Grandmother passed away. In the dream, a voice told her that, with her Grandmother's passing, Rhonda's back had been shattered. "Those are your relatives," the voice said, referring to the shattered pieces of her back. "You'll have to find a way to put them back together again." 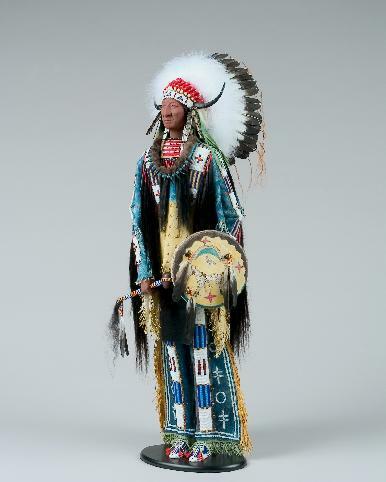 Rhonda says, �My dolls represent my relatives, past, present, and future. Without them, I could not be who I am today. My ancestors and their stories are connected like each vertebrae of my spine. I carry their story with me in my back. It's a strong place to be. ''Mitakuye Oyasin"
"Moon Daughter" copyright 2005 Rhonda Holy Bear - 3rd place in Diverse Art forms/Transitional Cultural Objects Category at Santa Fe Indian Market - SWAIA 2005. Copyright 1978-2011 Rhonda Holy Bear. All rights reserved. No part of this website may be copied or reproduced without the written permission of Rhonda Holy Bear.